Halloween is only a few weeks away making now the ideal time to pick up those ghoulish goodies ready to transform your home into a spooky haunted house! Party Pieces provide a wide selection of party supplies including a huge variety of decorations, treats and games for Halloween. We were kindly sent 3 items from their range to review and we have another set up for grabs to help make your party, perfect. This is the ideal treat for your little Moshi fans this Halloween. Our pack contained a puzzle and colouring book, stickers, a multi crayon, sweets, a ball and a badge. They would make a great party bag or prize for the little monsters that came to play or to give out as gifts to those that come knocking. 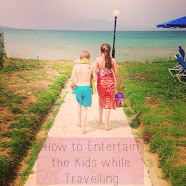 I also think these would be fab for travelling to keep the kids entertained! 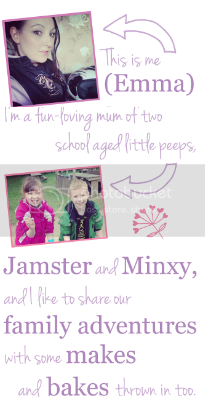 The Mini Mes really liked it and it is good value too at £3.99. 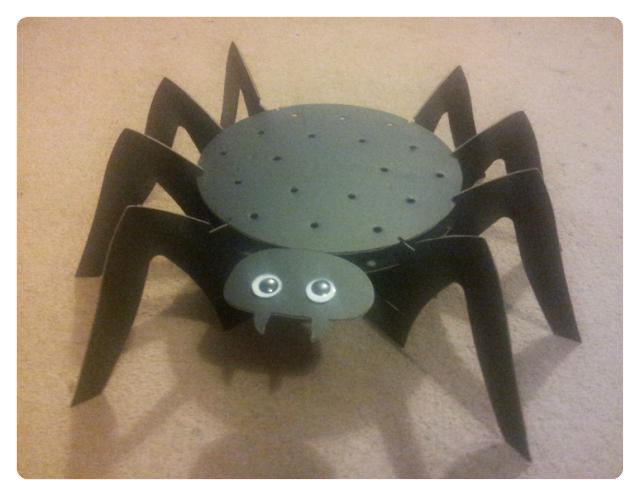 Store cake, cookie and lolly pops with ease on this spooky spider stand that will look great on your party table. The legs and dishes slot together quickly; it can be assembled within a few minutes, and it can be taken apart and stored for use year after year. Also supplied with the stand are 24 long sticks to place your cakes and bakes on. It's sturdy and a nice way to make your food look even more fab for guests. 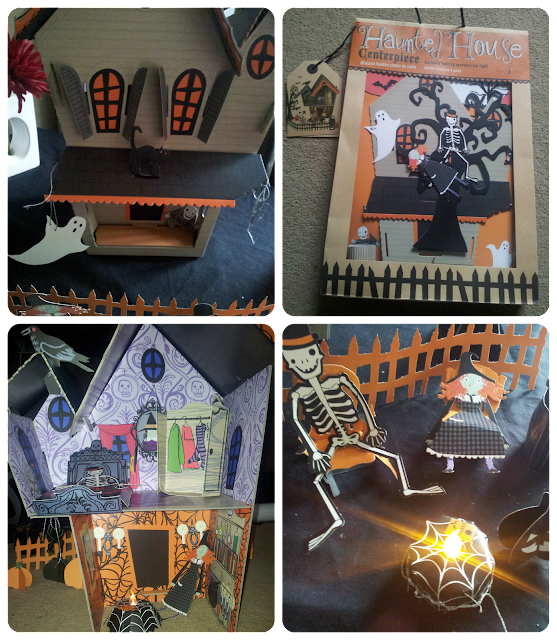 This Haunted house centrepiece is made from thick, flexible card which would look amazing in the middle of your buffet or lit up on your windowsill. It can be used as a play house too after Halloween - ideal for Moshi Monsters and Monster High dolls! The instructions provided are well detailed with coloured photos so constructing the house is simple. The battery operated tea light illuminates the house and creates a fun yet spooky setting. The house comes with 4 card figures, a tree with bats, a fence, tables, wardrobe, cauldron and more. For your chance to win a spooky Halloween bundle from Party Pieces containing a Moshi Monster Surprise Pack, a Boo! Halloween Cake Pop Stand and a Boo! Halloween Centrepiece you can enter via the Rafflecopter entry form below. The competition closes at the end of 28th October 2012. 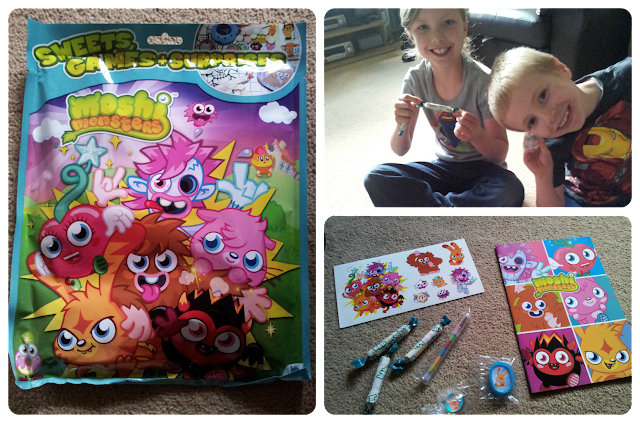 The Moshi Monster pack. My little girl is Moshi Monster crazy!! LOVE the centerpiece, too. I love the Halloween 3 tier cupcake stand it's fab! So many lovely things it's difficult to choose! The cake pop stand I might have to get one! Cake pop stand! Although my cake pops have thus far been quite unsuccessful! love the haunted house centrepiece!! I love the Halloween Glitter Pumpkin Favour Container... halloween is awesome!! My fave item is the Boo! Halloween Cake Pop Stand (and the cupcake one!) So cute and a clever idea! The Iloom ballons are cool! The Graveyard raiders are great !! I love the spider cake pop stand, I hate spiders normally but this one is cute! I love the Spooky Halloween Window Silhouettes. I like the Boo! Halloween Cupcake Holder! I love the pinata flying witch. I love the 'Age 1' t-shirts! The witch pinata! 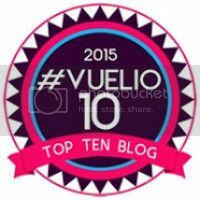 We had a football one during the world cup and it was so much fun!!! Love the spider balloon modelling kit, great fun! I like the Halloween Party Bingo Game - greast idea for a kids halloween party.